Kerameikos was named after the community of the potters (kerameis) who occupied the whole area along the banks of river Eridanos. The walls of Athens divided the area into two sections. The wall had two gates, Dipylon and the Sacred Gate, placed at the outset of the two most important processional roads of Athens, the Panathenaic Way which led to the Acropolis, and the Sacred Way which led to Eleusis. Outside the city walls, along the sides of both roads lay the official cemetery of the city, which was continuously used from the 9th century BC until the late Roman period. It was in this area that the roads to Athens from Piraeus, Eleusis, Boeotia and Plato's Academy converged. The road from Plato's Academy led up to the Dipylon while the lera Odos (or Holy Way) from Eleusis led up to the lera Pyli (Sacred Gate), built in , 478 BC. This gate was protected by two square towers and had a courtyard divided into two parts, one of which was occupied by the bank of the river. The Dipylon was the greatest and most official gate of the city of Athens, also constructed in 478 BC. It had two passageways that gave access to an internal courtyard with four towers erected at its corners. From this gate started the Panathenaic procession, the most important festival of ancient Athens, following the Panathenaic Way that led up to the Acropolis. Between the two gates stood the Pompeion which was the building from which the Panathenaic Procession used to set out. The Pompeion (5th century BC) was a spacious building with a peristyle courtyard, used for the preparation of festival processions. Sacral items used at the Panathenaic procession were kept at the Pompeion. The Kerameikos cemetery extended beyond the Dipylon Gate. Its most interesting section was the Street of Tombs (Odos ton Tafon), flanked on either side by the tombs of wealthy Athenians. 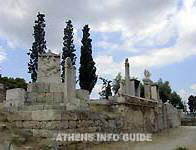 It was custom in Classical Athens that citizens were buried in Attica. Refusal to do was considered was heinous and punishable. Cemeteries were usually situated outside the city walls and the dead were either buried or cremated. procession and followed by the burial. The burial was accompanied by libations (the ritual pouring of liquids on the ground). This is why large amounts of pottery were found close to the tombs. Sometimes more expensive votive offerings were placed in tombs. People of high rank and wealth, expressed their status through the erections of funerary monuments which was regulated by special laws. Following the funeral, first degree relatives had to perform rituals every year on specific dates in honor of the deceased. You can find information on the Kerameikos museum on our museum pages.